I am a huge fan of the ballet and a big supporter of the English National Ballet in particular, so you can probably guess how excited I am about going to see their production of Le Corsaire in November!! 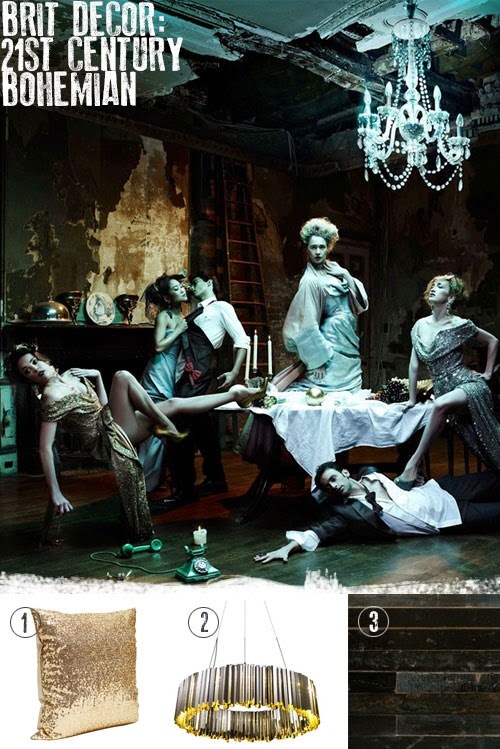 Already in the mood for tutu's and high drama, I have drawn inspiration for today's dramatic styling from these striking scenes, which were styled by Tom Sharp and the amazing Vivienne Westwood for a recent ENB publicity shoot. If we are talking high drama with a Bohemian twist, then dark and alluring background colours will add a sense of mystery and depth to a room but be sure to add strong feature lighting for the perfect contrast and embellish with luxury items, ideally ones that emit a sparkle, like glistening treasures. In terms of value for money and impact, there is no beating the fabulous gold sequin cushion cover from H&M - be sure to position this near to a light source to accentuate the sparkle. The contrast this has with darker colours, such as the clever Scrap Wood wallpaper from Rockett St George is incredible! I'm still rocking the Great Gatsby look ever since watching Baz Luhrmann's film earlier this year so I was unable to resist this glam Grande Gatsby cushion from Aura - the perfect look for a luxe party feel and talking of luxury, I spotted this embossed note book by Christian Lacroix at Heals, which makes me want to trade in my computer mouse for a pen right this minute! Only last week I discovered the new and exciting lighting collection from The Electrical Shop (check out their blog here) and this cage light seemed perfect for bringing the Bohemian into the 21st Century.